The Jerez Horse Fair, the Feria del Caballo, is one of three major festivals held in this small but perfectly formed city in the south west corner of Andalucía. However, even though the Sherry Festival and the Flamenco Festival are both hugely significant events, there is no doubt which of the three is the prime festival of Jerez de la Frontera – the Festival of the Horse. It was back in 1264 that Alfonso X – ‘the wise’ – completed the reconquest of the city and, as a perpetual commemoration of this, he granted two annual duty-free fairs, one in April and the other in October. By the Middle Ages, the former festival had developed into an occasion when herders and farmers would bring their livestock into the city and, in 1481, there was legislation about where the major events should be held. It was the 1955 Fair when the Domecq Sherry family initiated the idea of a festival as a celebration of the prominent place of the horse in the city. It used to be that gypsies would come to the Jerez fairs in order to make money by entertaining with their performing horses. Nowadays, the Feria del Caballo attracts thousands of visitors from around the world every May, drawn by a fascinating variety of events. The Gonzalez Hontoria Park, covering 52,000 square metres, is the site of the major events – superb displays of horsemanship in all its forms obviously taking centre stage. Here you will witness doma vaquero and doma classica – cowboy and classical dressage, riding competitions, polo and fabulous displays of carriage driving. In addition, there are flamenco displays, bullfights, a fun fair and well over 200 casitas – the traditional Spanish equivalent of the Fete marquee, where you can enjoy lots of good food and, of course, many glasses of sherry! The locals will be drinking fino, but you might also see many of them mixing it with lemonade or Sprite in what they know as a ‘rebujito’. The streets of Jerez are taken over during the festival by parades of horses – both official and completely unofficial. You’ll be bewitched by horses strolling elegantly along the streets ridden by immaculately clad aristocratic-looking men, with beautifully dressed women behind them, in full flamenco style, managing to look poised and sophisticated sitting on a horse’s rump. At the same time, there will be English, Hungarian, Russian and Spanish-style carriages, all exquisitely decorated, parading effortlessly through the cobbled streets of the old centre of town. Jerez Horse Festival offers Andalusian Chic at its most beguiling. Then, at night, the colours and flavours change as the guitar rhythms accelerate and the wine flows more freely, horses hoofs are replaced by stomping flamencos and the parties last well into the early hours. 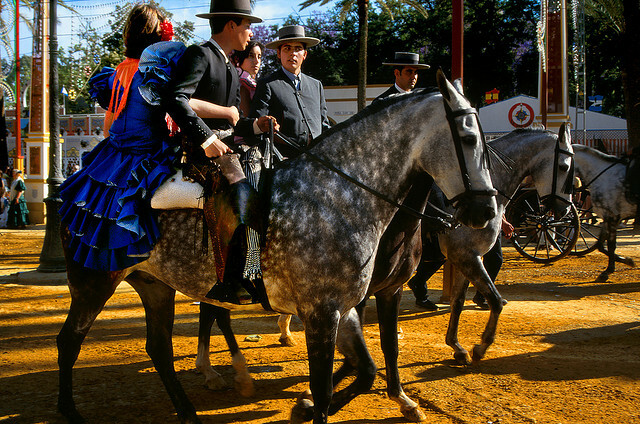 Jerez Horse Festival takes place just after the equally famous Seville Fair and it shares a similar atmosphere. This is an occasion that has been categorised, perhaps rather pompously, as a Festival of International Tourist Interest – but it remains, at heart, a festival totally linked with Andalucía; but where the residents are delighted, if sometimes a little surprised, to see visitors entranced by it all. Whether you come to Jerez during the Horse Fair or at other times of the year, then a visit to the Royal Andalusian School of Equestrian Art (La Real Escuela Andaluza del Arte Ecuestre) is one of the things not to be missed. Several days a week the horses and riders present a memorable show known as “Como Bailan Los Caballos Andaluces” (How Andalusian horses dance) which can best be described as an equestrian ballet. With full costume and music, visitors can see demonstrations of classical and cowboy dressage, carriage driving, work in hand (where the horse performs without a rider on its back) and, as a thrilling and spectacular climax, the carrousel, in which a number of horses and riders perform in breathtaking unison. It is best to book tickets in advance for this show, as it is incredibly popular. Day excursions from Seville are available to this performance. If you’re there on a day when there is no show then there are times available when you can watch the horses in training. It’s also possible to tour the stables and the museums, where there are displays of carriages, tack and harnesses, blacksmithing and equestrian art – all in the beautiful setting of the historic nineteenth century Palacio de las Cadenas, with its delightfully cool gardens. Just to lend even more appeal to the visit, the School is right next door to the Sandeman Bodega which offers a really good sherry tasting tour! The horse has a prominent place in the story of Andalucía and it is a story that is celebrated with tremendous gusto every May in Jerez, the city at the very centre of Spanish horsemanship. Click here to get dates for the next Jerez Horse Fair. 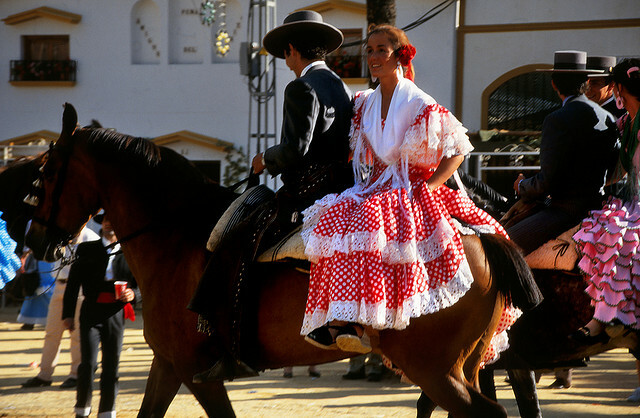 Have You Ever Been to the Jerez Horse Fair? If so, you are very fortunate indeed. This fiesta is such a celebration of everything that is great about Andalucia. Please tell us any interesting tales about a visit to Jerez de la Frontera in the comments box below or send us your useful travel tips. Such information is always welcomed by our community of readers. Thank you for a great article and calling attention to this incredible event. I hope to attend it one day. Spanish culture at its best. i had a great time at the feria a few years ago! Love horses and dancing sevillanas. I decided to go at the last minute, so I stayed in Sevilla at a hotel I knew and took the train to Jerez. There are buses, too. thanks Gerry, it looks wonderful. I would love to attend one day. This is a great equestrian event. I travelled there by train from Seville and arrived too early. Crowds were heading along the street to another venue, it was the old bull ring which hosted fantastic carriage driving. Please don’t miss it prior to events starting at the main arena. The bullring, carriage driving event may start as early as 10am, the main arena about 1200 or 1230 hrs. Best Regards, Roger, Hobart, Australia. Thanks Roger for this very useful advice. I stayed in Jerez for the entire festival week during 2006 and,2014. An amazing week of horse show classes,auction/sale of horses in the main hall.The parade of both horses and, carriages in the park throughout the day. Also a small show event set to music with flamenco dancers held in the display ring beside the main hall. The programme sadly is only in Spanish so it is difficult to be in the right place at the right time but, make enough time to look across the road to another small park where there are show classes and,a parade of vintage carriages on one particular day (possibly Sunday). The horses and,carriages leave the main park during early evening and,many more people arrive to visit the casetas for music and dance. Most of these are free to enter or, the door men may give out tickets to certain ones. The cost of hotels is enormous at this time that’s if you can find a vacancy. Flights direct to Jerez are limited from London so book early. Seville is an hour by train to Jerez but it’s better to stay in Jerez to be amongst the late evening fun. The park is free entry but the main hall has a reasonable charge. I noticed a huge increase in beggars and other people selling rubbish constantly in your face which spoiled things as you didn’t get a minutes peace if seated with a meal or drink. It would be a big help if the authorities moved these people on or prevented them from going into the park. There is also a huge fun fair and,many stalls selling various items. There are lots of taxis to get you to and from hotels.If you are a horse lover it should be on your bucket list – Horse heaven!